This November will be the fourth time I participate in NaNoWriMo (I can’t believe I’ve already been writing this long). In order to help keep myself accountable, I like to announce the project I’ll be working on ahead of time. Last year, I only had a working title and a rough cover, which I shared alongside a quick blurb and an excerpt. That novel has grown into In the Lurch, which releases next week. But this year, my novel declaration is a little more nuanced. 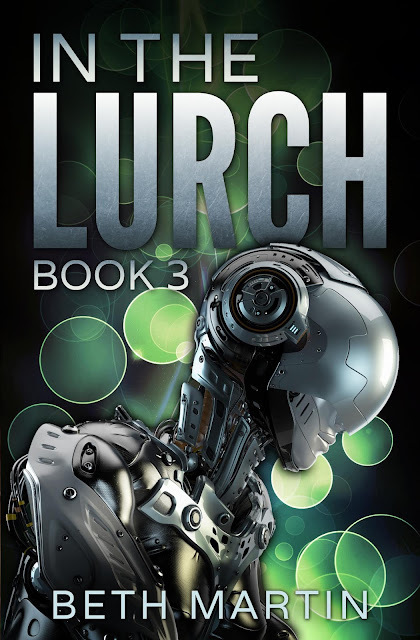 I’ll be working on the third installment of the In the Lurch series, however, I haven’t made any sort of announcement for the second book, so I feel like talking about the third one right now is a little premature. And, I’m not entirely ready to reveal the second one, so you see why I’m hesitant. In the future, robots have completely replaced the middle class, making those who own robots incredibly rich and throwing the rest of humanity into extreme poverty. Continuing the story of Roemell and Leona, Book 3 will expand on their world and reveal the evils behind a terrorist plot. Roemell stared out the window, taking in his surroundings. He had only seen pictures of older cities in textbooks, but the capital was completely different than anything he had seen before. All of the buildings were towering behemoths made of steel and glass. Deserted sidewalks lined the road, and each space between buildings was crammed with vibrant green plants and trees and an entire rainbow of flowers. Every inch was pristine, but instead of giving a clean aesthetic, it all came across as fake. A gasp escaped his lips as they passed a building he recognized—the Lincoln Memorial. Although the brass statue of the former president was gone, the pristine columns of the ancient structure were unmistakable. “You all right?” Leona asked, placing a hand on his knee. I’ve tried to write a series before without success. I got bogged down in book two, then abandoned it after trying to make it work for way too long. This time is different though. I was excited about the character and world and was able to write book two and I’m still excited. There’s more story left for the characters, more truths to discover, and more baddies to fight. If you’re participating in NaNoWriMo this year, make sure to add me as a buddy! I’ll be sharing my entire NaNo journey on my social media, so if you don’t already, follow me on Instagram and like my Facebook page.